We are a gated community. DO NOT use GPS or internet directions as it will send you to the wrong gate. Indian Palms Intervals is located within the Indian Palms Country Club. The Country Club address is different from the Resort address. If using GPS you may put in 48-630 Monroe St., Indio, CA 92201 to get to the main gate. 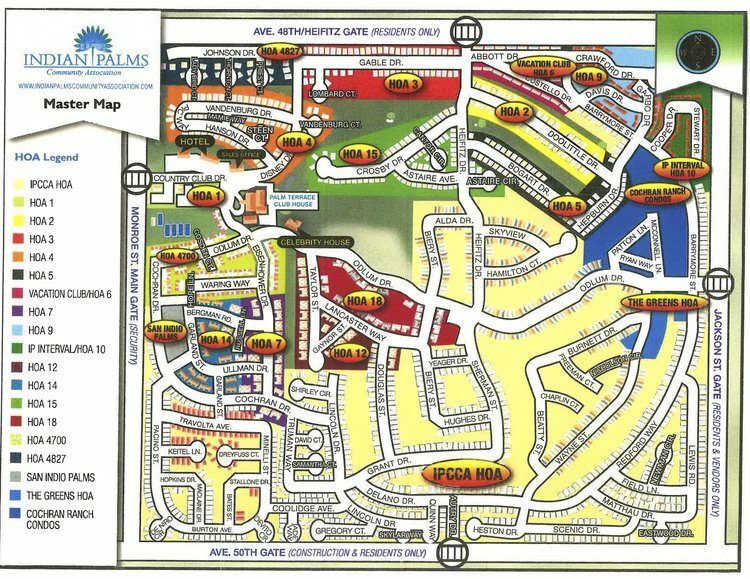 As you enter the Country Club property, please inform the security officer that you are checking into Indian Palms Intervals, and if necessary ask for the map to the office. It is the same map shown to the left. You can download the map here. We are located in the back of the Country Club. You’ll find that there are several residential neighborhoods, as well as another Time Share and a hotel within the Country Club. From the airport go out the Ramon Road exit and turn left (east) and take Ramon Road to I-10 East. Take I-10 East to Monroe Street exit in Indio. After you cross over 48th Avenue make a left at the next signal light, Country Club Drive (Entrance into the Country Club). Let the security guard know you are a guest of the Indian Palms Intervals Timeshare. Please follow our directions. A GPS will send you to the wrong gate! Note: Due to our location, having a vehicle is highly recommended.